Divine Praises: Blessed be God. Blessed be His Holy Name. Blessed be Jesus Christ, true God and true Man. Blessed be the Name of Jesus. Blessed be His most Sacred Heart. Blessed be His most Precious Blood. 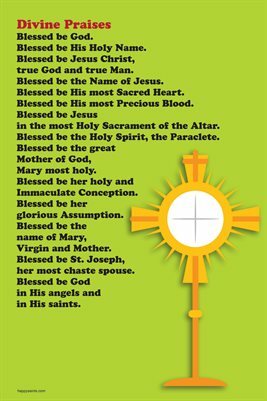 Blessed be Jesus in the most Holy Sacrament of the Altar. Blessed be the Holy Spirit, the Paraclete. Blessed be the great Mother of God, Mary most holy. Blessed be her holy and Immaculate Conception. Blessed be her glorious Assumption. Blessed be the name of Mary, Virgin and Mother. Blessed be St. Joseph, her most chaste spouse. Blessed be God in His angels and in His saints.